Between the hot summer days, Vancouver receives a reminder of its Raincouver moniker with rainy and windy days. What better way to keep warm and survive the dreary weather but with a nice hot bowl of noodle soup or congee! It’s my go to comfort food! Neptune Wonton Noodle recently opened in Station Square adjacent to Metropolis at Metrotown in Burnaby. I went with some coworkers to Neptune this week for lunch to warm up our bellies. Being a Wonton Noodle restaurant, it was a must to order their wonton noodle – which I prefer with thick noodle. How the noodle selection works is that at most Chinese noodle restaurants that offer an extensive noodle soup menu your soup noodle automatically comes with skinny wonton noodles, however there is an option to request thick wonton noodles, thick rice noodles, or rice vermicelli noodles. 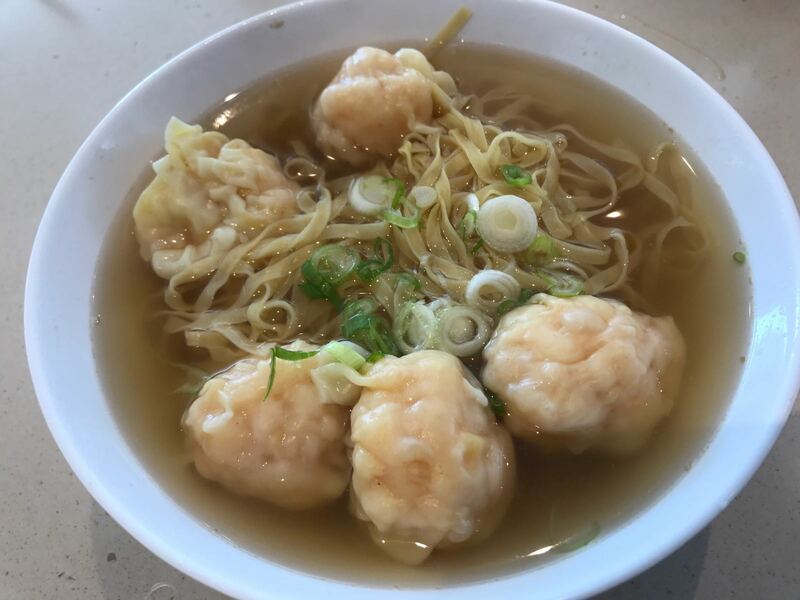 I find the thick noodles are more provide a perfect texture with the shrimp shell based broth and the 5 large shrimp wontons. For $7.25 a bowl, this is a great deal for lunch! 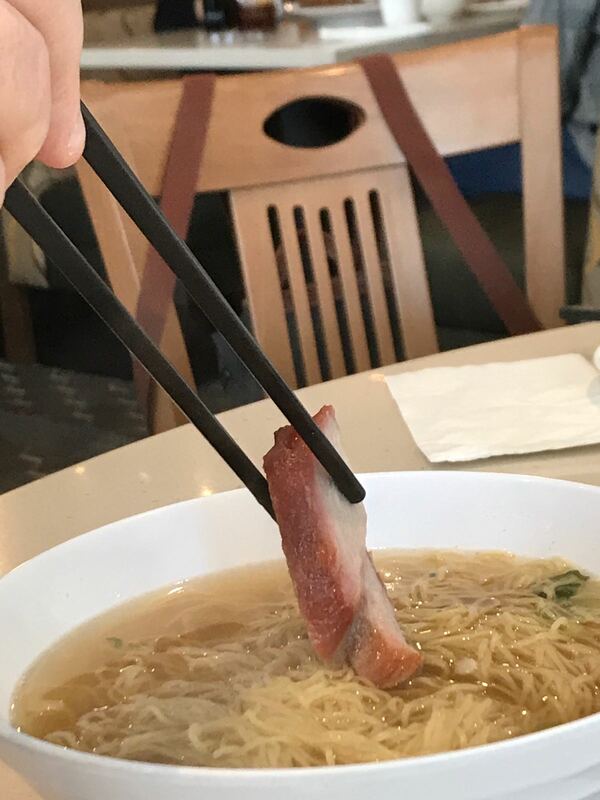 Two of my coworkers ordered the BBQ Pork Noodle soup, with the BBQ Pork being served on the side with the noodles. The portion of BBQ pork provided was generous, looked to be half fat/lean, the perfect amount of fat to give it the juicy texture, and sweetened with honey. When dunked in the soup, the BBQ pork gave the soup a sweet flavour. 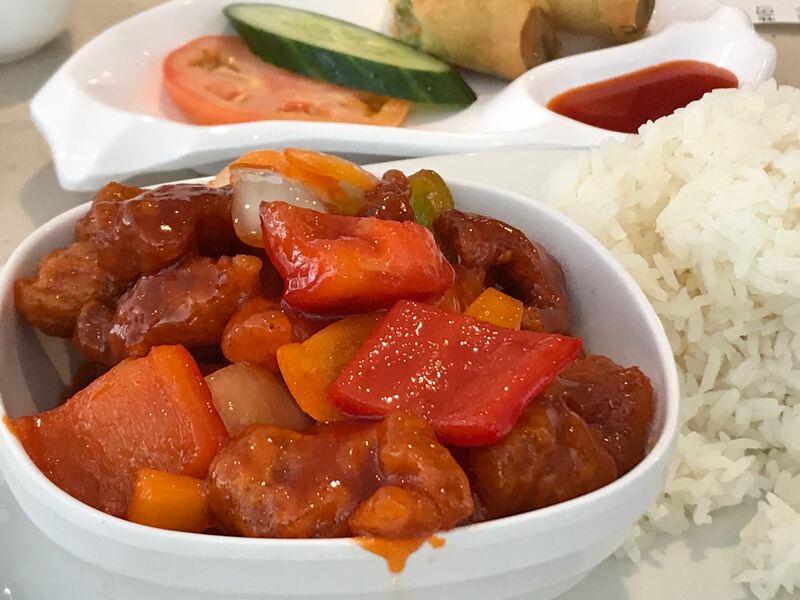 If you’re unsure what to order due to the extensive menu that includes dim sum, noodle soup, congee, fried rice, and more check out their Daily Lunch Specials on the menu for $10.99. We went on Monday so the daily special was Sweet & Sour Pork with Pineapple on Rice and came with salad vegetable spring rolls. The portion size is more than enough for one person. The Sweet & Sour Pork served was succulent, fried but not over fried to give it a dry texture. For dessert, there are several options including mango pudding, sweet almond tea, steam ginger custard, and more. We opted to try their lychee & osmanthus cake as some of my coworkers were curious on what it was. 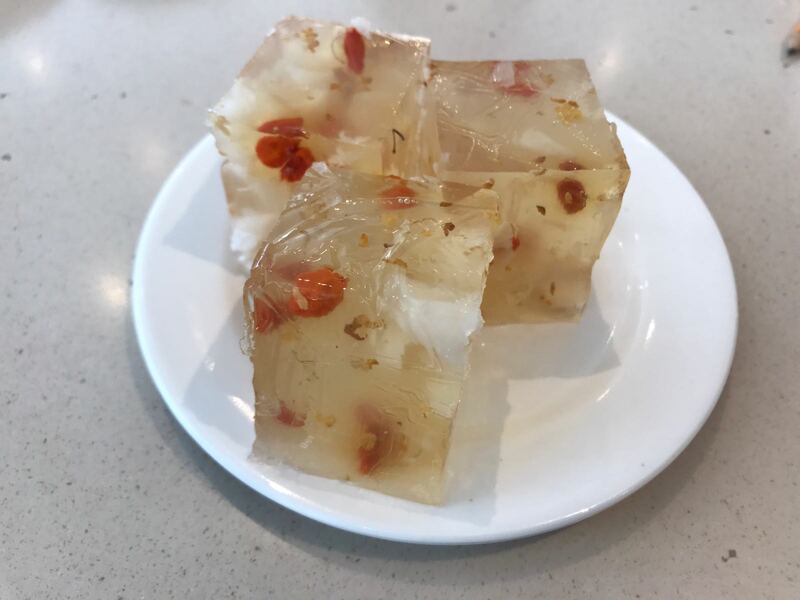 A gelatin-based dessert, the ingredients were lychees, goji berries, and osmanthus (flowers similar to chrysanthemum and used in Chinese teas). The lychee flavour is strong in the dessert and enjoyable if you like the taste. Neptune Wonton Noodle has ample seating – great for small and large groups for lunch. They also have an extensive dinner menu worth visiting for. 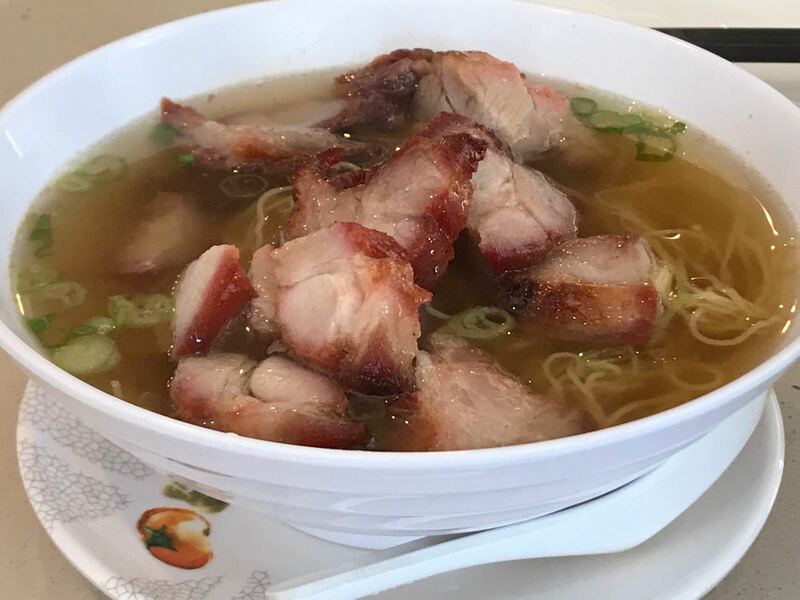 Definitely worth visiting again for just their wonton noodles if you have a craving for some warm comfort Chinese dishes. Neptune Wonton Noodle is part of the Neptune Restaurant Group that has other locations at Surrey Central City, McArthur Glen Outlets at YVR, Hard Rock Casino in Coquitlam and original location in Richmond. For a list of restaurant locations and menu offerings visit: http://neptune-restaurant.ca .